China International Aviation & Aerospace Exhibition (namely China Airshow) is the only international aerospace trade show in China that is endorsed by the Chinese central government. 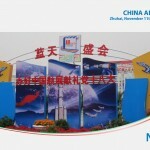 It features the display of real-size products, trade talks, technological exchange and flying display. Since 1996, the show has been successfully held in Zhuhai in every even-number year for nine sessions. Airshow China 2014 will take place from Nov. 11-16, 2014. – Heating and de-icing systems for the aviation and aerospace industry. The Italian delegation is represented by: ACELABS, DAVI Promau, NEOS, NG WAY, SORMA, TPS and ZOPPAS Industries at the Boot H5-10C.